Northampton Town captain David Buchanan claims a group of fans challenged him to a fight after their League One game on Saturday. 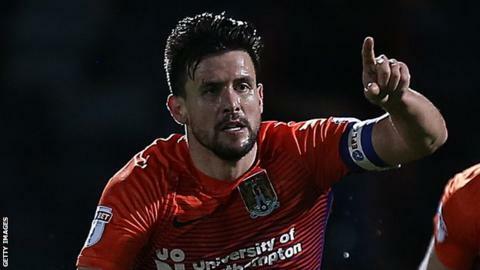 The defender, 31, says he was threatened after the 1-0 home defeat by AFC Wimbledon which left the Cobblers next to bottom of the table. They have lost nine of their 14 league games and only have nine points. "They were young lads, 17, 18 years old. I don't want altercations with supporters," he told the BBC. Speaking to BBC Radio Northampton, he added: "Every time I set foot on the football pitch, I give my best for the team, and I clap supporters because I appreciate everything they do, they pay their hard-earned money. "Whether I'm here, or somewhere else, they're still going to be Northampton fans but after the game a group of lads tried to offer me out for a fight. I said to them 'grow up a little bit, we're in this together'. "'Remember where the club was two or three years ago and look what's happened, keep believing in what we're doing and stick together, and we'll move forward together'." Northampton had to win their final two games of the 2013-14 season to avoid relegation from the Football League and were served with a winding-up petition from HM Revenue and Customs in October 2015 before being taken over by former Oxford chairman Kelvin Thomas the following month and winning the League Two title that season. A Chinese firm bought a 60% stake in the club this summer, but manager Justin Edinburgh was sacked after their poor start to the season, with Jimmy Floyd Hasselbaink brought in as his replacement. "Some of the performances have been unacceptable if I'm being honest," added Buchanan, who was speaking following Tuesday's 2-2 draw at Rochdale, in which he scored the goal that earned them a point. "But this football club's been in worse positions than where we are now and we've come out on top so it's important that everybody in the club, the staff, the players, the supporters, all stick together."